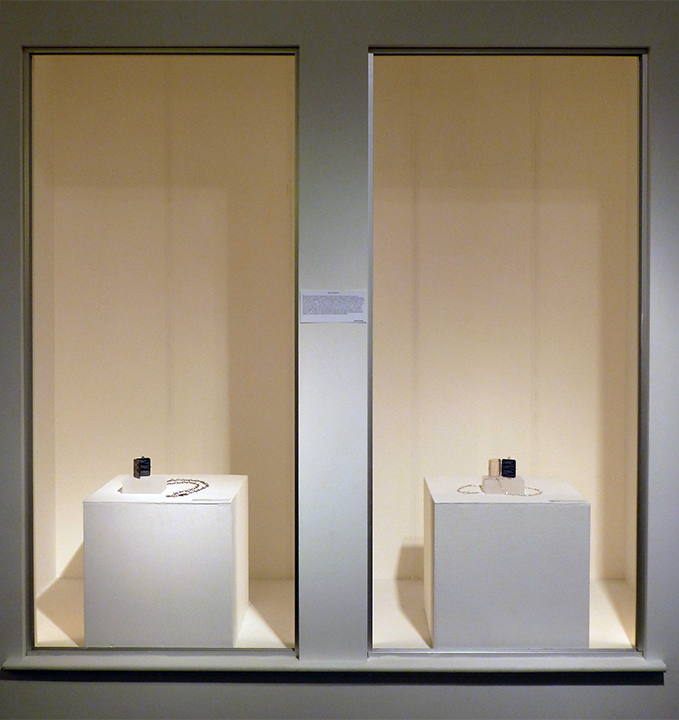 P.Sullivan, installation view, “Widget Locket #2 and #3”, at Lapham Gallery, NY. Chased and repoussé sterling, fabric, Plexiglas, archival paper. Opening night, 8/2014. The Lower Adirondack Regional Arts Council (LARAC) opened its Fragments art exhibition last month in the architecturally beautiful Lapham Gallery in downtown Glens Falls, New York, showcasing substantial artworks juried and envisioned by Gallery Curator Jenny Hutchinson. As one of four artists selected for this exhibit, I traveled over 250 miles each way from my New Jersey homebase to participate and present a gallery talk about my one-of-a-kind jewelry, Widget Lockets on display, along with fellow artists Anne Stagg, Liz Parsons and Nick Squadere. The gallery itself is quite expansive at 1900 square feet, and to see my entire collection of Widget Lockets in one gallery, alongside the stunning abstract paintings and installation work of my fellow exhibiting artists was quite a thrill to view, in-person. Anne Stagg, “Unintended Consequence Series: Discourse”. Oil on canvas. 36in.x54in. Photo courtesy of the artist. Anne Stagg: “Unintended Consequence Series: Trickle Down”. Oil on canvas, 36in. x 54in. Photo courtesy of the artist. find their match; environmental, social and economic issues pervade Stagg’s work. In her gallery talk on opening night, she shared how she feels personally uncomfortable with stereotypes one may hear of growing up in the American South and how currently, she channels awareness of social issues into her painterly work, coming out through her extremely detailed iconographic symbols and patterns. 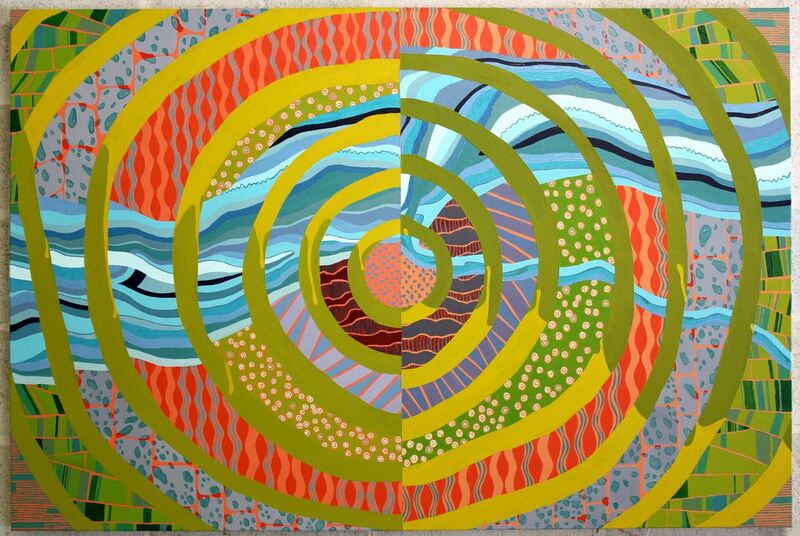 Seeing Stagg’s work recalls the vibrant details inspired from the Pattern and Decoration Movement in U.S. painting history, such as Mississippi-born Valerie Jaudon or New York’s Joyce Kozloff. Liz Parsons: “Get Her Words Out”. Installation (mixed media). Install detail view, Lapham Gallery, Glens Falls, NY, opening night, August 2014. Liz Parsons: “Get Her Words Out”. (Typewriter detail view.) Installation (mixed media), 2014.
or more, adding each piece to the whole, while not removing aspects of being all handmade. Though not pictured here, there are also numerous drawings done by Parsons that accompany this installation on the gallery floor and walls. Besides inviting the viewer to participate and walk through the installation, as many gallery visitors such as myself did opening night – the artist has included a found-object and now-antiquated typewriter, with a notation above that invites visitors to type-out any sentences of his/her choosing. Parsons plans to add these newly typed verses/fragments to the final installation when it reaches it permanent location. Local Glens Falls artist Nick Squadere presented several large-scale abstract paintings and drawings, including his Yada Yada Yada piece. Squadere creates his paintings intuitively with inspiration from everyday language, symbols and archetypes. Interestingly, it appears as though sections of canvas are overlapped and either attached in some way to resemble a hand-sewn process. Even a label is torn off an indeterminable object and placed in a haphazard way on the canvas’ lower center half to help the viewer visualize how Squadere aims to keep his canvases ‘spur of the moment’. During his gallery talk, the artist shared some of his influences, naming New York painter Ellsworth Kelly as one of his personal favorites. Squadere, however, breaks from Kelly’s very ordered geometric shapes while instead maintaining a painterly ‘looseness’ with his brushwork; the bright color palettes of Ellsworth Kelly paintings are a visible influence in Squadere’s latest works, though, especially in his Cold Turkey canvas. 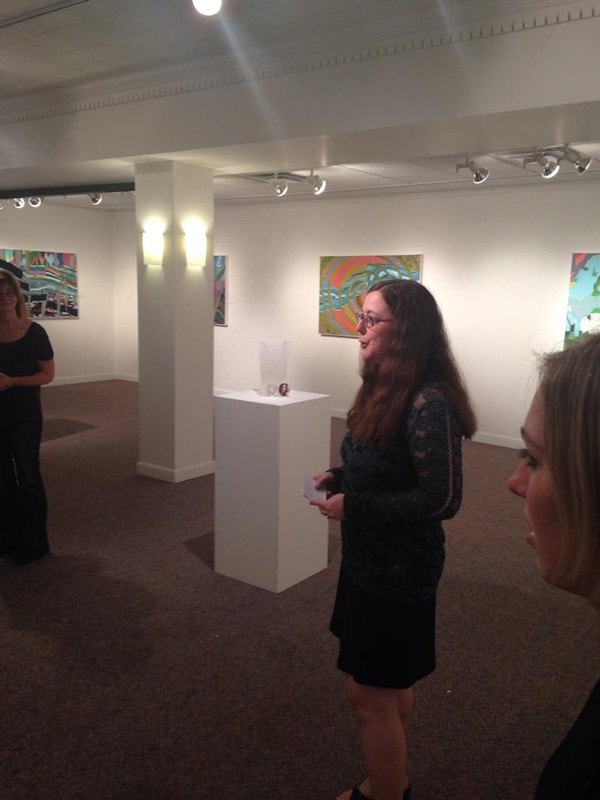 P.Sullivan (center) presenting her artist talk on opening night, ‘Fragments’ exhibition, Glens Falls, NY, August 2014. 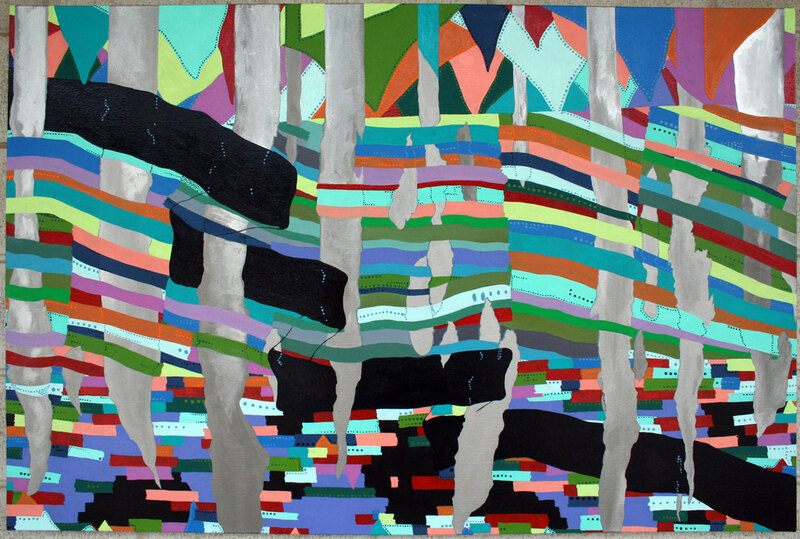 Fragments, an art exhibition presenting substantial works by artists Patricia Sullivan, Anne Stagg, Liz Parsons and Nick Squadere, is on view at the Lapham Gallery at LARAC, located at 7 Lapham Place in downtown Glens Falls, New York through September 19th, 2014. Great review, Patricia! I really got a sense of all the unique work at the show. Is there a picture of all of your lockets together, or were they too spread out? The typewriter is also a great idea. There’s one of those at a restaurant in our area, near the bathrooms, and it’s always full of interesting snippets from customers! My lockets were placed on six different pedestals, spread throughout the main room. I do have individual shots of ea. piece on my Instagram – over there as “artdoesmatter12”. I LOVE hearing about the typewriter you’ve seen before! It really IS an interesting way to get people to “shoot from the hip” – yes? Thanks so much for stopping by and leaving such great feedback, Laura!! Patricia! How nice! Congratulations! The work is of a high level and you should be very proud at having been accepted. And written about and photographed: Both of yourself and of your work. Also validation for your extremely unusual lockets. Wow! Hollis, thank you so much – your lovely comments are so appreciated. And coming from such a talented artist as yourself (w/ a NYC gallery, no less!!) I agree – the other three artists who also were exhibiting showed extensive bodies of work. It’s a gigantic gallery space and so lovely. Wish I could post more pictures here, but I hope those local to the Adirondack area of NY will stop in and pay a visit to see the show in-person. Thanks again for dropping in today!! Great article, Patti. As one who attended the opening of this exhibition, your article captured both the detail and feel of the works of the other artists. My only other observation is that you have been (understandably) modest and brief in your comments about your own contribution. As I am not constrained in the way you are, let me share with the readers that your pieces were very interesting and they bear close study. As you indicated in your artist’s talk, your intention was to juxtapose the old with the new and to create reflections on the transient nature of seemingly important events. You have done this very well in your pieces and I would commend everyone who has the opportunity to consider your work for themselves. Congratulations. Phil, what a beautiful commentary on both my own artwork and the exhibition as a whole. What’s so fabulous about your words is that it’s based on your own observations on opening night. I’m overwhelmed by your generous comments about my metalwork and the concepts behind it; thank you so much for sharing further info from my artist talk! I am beyond thrilled both you and Annemarie arranged your summer holiday plans to be w/ me at my opening! It was my pleasure, Patti. Anita, thanks so much for stopping in and sharing your uplifting and generous compliments re: the show and my work! I would’ve especially liked if you lived closer to this gallery and could’ve heard my talk about my lockets and also see the painting works of the others, in particular. I realize how this is an extremely busy time of year for you, as you work to get all your new gorgeous paintings ready for your October event. I genuinely appreciate ALL your visits to artdoesmatter!! Sharon, you always know what to post and say here that leaves me so speechless!! First off, I’m so happy that you liked seeing Anne Stagg’s painting series. 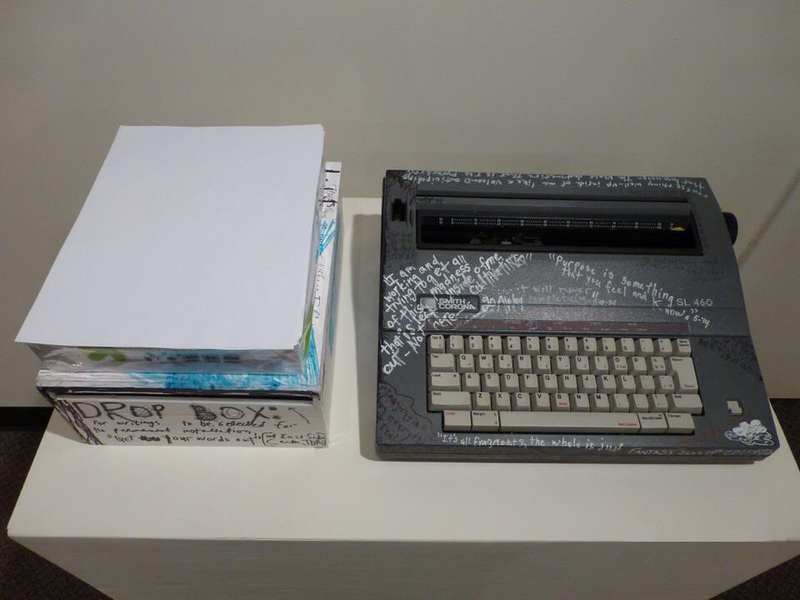 I agree – reading your typed-out musings on Liz’s typewriter would’ve been worth its weight in gold; also w/ hearing your feedback w/ Nick’s paintings. It pleases me to know that you understand how fortunate I feel to have my jewelry pieces spread out across such a beautiful and lovely space as this gallery offers. One day – I would love nothing better than to walk through a gallery in Melbourne w/ you and take in any exhibit – whether of your work, or any artwork we found mutually exciting! Sharon, I can’t thank you enough for dropping by and sharing your lovely comments w/ me (and the other artists in this show). I look forward to hearing more about your upcoming projects and exhibits! First of all, congratulations, Patricia – and even more so for having your entire series of lockets included in the show. I often make series myself, but I find it frustrating when I can only show 1 or 2 pieces at a time (which is often the case). I am glad you had this well-deserved opportunity. It is so much more satisfying for the maker – and the viewer of course – each piece resonates with its neighbour and in turn adds more depth and breadth to the artist’s vision. As always, you reviews are very interesting and engaging. I particularly enjoyed your description of Liz’s work, and thanks to your personal insight (your conversation with the artist), it is wonderful for us readers who can’t see the show in person. I wish I could have heard your presentation though. Any chance you’ll tell us more about it in another post? Dominique – this is the first time, in fact, all of my “Widget Lockets” have been shown together. The gallery has a sprawling main room – so while the painters took to the walls – this wonderful curator allowed me to dominate the floor space w/my jewelry on plinths. When I wrote an exhibition proposal to be considered for a show, I requested this set-up, due to both the outside/inside of my lockets requiring a full 3-D display. 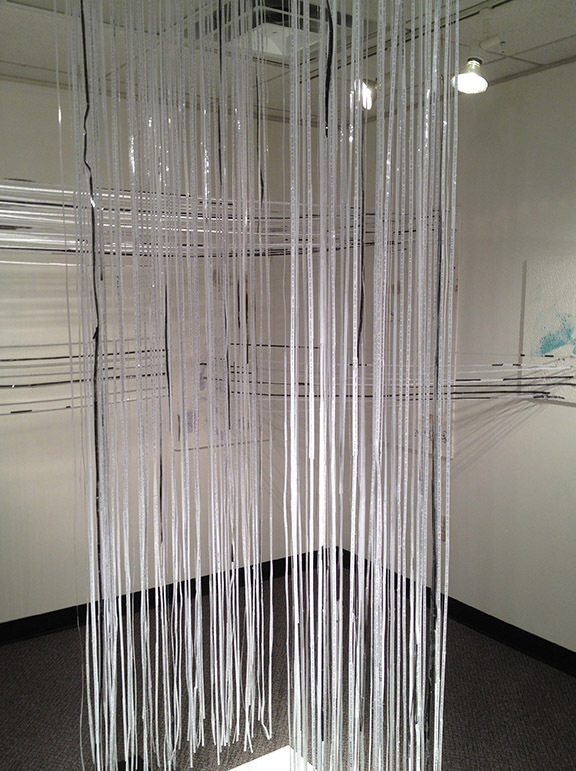 It is, in fact, my first substantial showing of work (outside of the thesis exhibition in metals one does at school.) Therefore, I completely understand that feeling of frustration when we as jewelers are only able to show one or two pieces in a large, juried group exhibit w/ maybe as many as 20-35 artists. Thank you so much for asking about my gallery talk! While it was only a brief overview – I hoped to communicate as much about the transient nature of technology and how obsessive we all have become. What a fab idea to develop a different post regarding this. Something to think about, particularly as I will continue to apply to new shows and hopefully, refine my ideas! I really appreciate your visit and lovely feedback today, Dominique – thanks again! Congratulations, Patricia! You’ve had an awe-inspiring exhibition history this year. Also, stunning composition of the image you captured of Widget Lockets #2 and #3. (I’m a huge fan of symmetry – haha.) I hope to see these pieces in person at some point in the near future! Also, I appreciate the thoughtful summaries you’ve written about your fellow exhibitors’ artwork. Gina, I’m overwhelmed by your highly generous feedback. The gallery curator Jenny designed that setup of those two pieces, and it really looked spectacular. She thought to place those pedestals into the built-in areas of the gallery floor; it was the perfect complement to my other jewelry arranged around the main room. Thanks also for the kind comments re: my ‘take’ on Liz’s, Anne’s and Nick’s artwork. It’s difficult sometimes to write something so brief into one blog post yet still attempt to communicate all their works’ individual messages. Your visits are so appreciated, Gina – thank you again for stopping by today! Looks great Patricia…. well done & congrats 🙂 All of the other works look fantastic too – am intrigued by the installation! Dawn, yes – because you do installation art also, it would be great if you could’ve walked through Liz’s piece or w/ your additional writing and poetry blog – I’d love to see what you’d place on that typewriter!! I’m quite pleased you stopped by today, as you are one of the few artists I know that keeps your art practice involved with both ceramics AND installations. Congrats to you, also, on your recent solo exhibition and recent shows! And both my husband and I remarked the same about the old manual typewriter days! Three cheers Patricia! It sounds like an interesting show all round. Big hits in the eye as well as miniatures and print for careful consideration. Lots to ‘hold’ with the eyes. And talks as well – a big night. Congratulations. Congratulations on this recent exhibition success! Your art is wonderful and matched by your ability to write about art in a comprehensible manner. I hope your skills as an artist and writer will continue to open doors for you. Al, what an awesome and generous comment! Thank you. Russel, thanks so much for stopping in today. I’m taking a brief blogging break for a few weeks as I’ve started making some new artwork that I’m going to be sharing over “artdoesmatter” soon. I really enjoy your blog and your perspectives on what you write/photograph. I’m extremely jealous of your current San Diego weather/ warm temps as it’s supposed to dip into the high 30s F here tonight! !